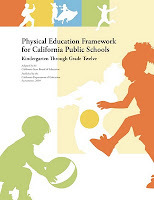 The new Physical Education Framework for California Public Schools is out and I've attached the pdf link to download it. If you are interested in a hard copy of the document you can order it from the California Publications and Sales Office Catalog. I am pleased that I had the opportunity to work with a group of great professionals in writing the PE Framework.